Can Immigration Save the Cities? Wausau, Wisconsin may seem like the furthest thing from a global mega-city, but the forces in play in this small city are echoes of the worldwide issues of population and immigration. Over the past decades Wausau has received a large influx of Hmong, a nomadic Laotian hill people who fought under the direction of CIA advisors during the Vietnam War era. After their communist enemies won control of Laos in that country’s civil war, the Hmong were largely abandoned by the international community, and many fled for fear of being killed in retribution of their pro-American efforts. With 5,000 Hmong now living in Wausau’s Marathon County, and 400 more in the pipeline in 2004, the Wausau Daily Herald paints a rosy picture. "Health systems are in place to accommodate the newcomers," the paper wrote. "Residents have donated enough household goods to satisfy the initial material needs of a majority of incoming refugees." The article offers encouraging statistics about Hmong integration, employment and home ownership. But not everyone is pleased with the steady stream of refugees. The Stevens Point Journal attended a stormy meeting of a tri-county consortium last year. "We need to be rattling some cages in Madison because of the fiscal impact of this," said consortium chairperson David Pagel. "We need to be talking about how we will pay for increased services and workloads." The first influx of Hmong from the late 1970s to the early 1990s created strains in Wausau. When the CBS program 60 Minutes visited, three quarters of the 4,000 Hmong then in the city were on welfare, and their children made up a quarter of the city’s elementary classes. Writing in the Atlantic Monthly, Roy Beck noted that the Wausau school district’s property tax rate rose 10.8 percent in 1992 alone, partly because of costly bilingual education programs. "Now we’re beginning to see gang violence and guns in the schools," said former Wausau school board member Fred Prehn. Many of the tensions have since eased as the Hmong have left the welfare rolls and integrated into Wausau’s mainstream, but some say a new influx has strained resources (and led to what some Hmong say is a new pattern of discrimination, including a "parking ban" at a downtown park). The issues in Wausau are a microcosm of the growing pains many American cities are experiencing as they try to cope with large immigrant populations. Many Midwestern states would not be growing at all if it were not for immigration. According to the Midwest Coalition to Reform Immigration, two thirds of the 1.5 million new residents of Illinois by 2025 will be immigrants. Los Angeles (13.1 million population in 2000) is the destination of 41 percent of California-bound immigrants, and must service the needs of more than 500,000 school students with Limited English Proficiency (LEP) and provide services for the immigrants who make up nearly half the welfare population. California’s net cost for providing government services to illegal immigrants approaches $3 billion per fiscal year. "As their populations grow," says Bill Ryerson, president of the Population Media Center, "cities like Los Angeles are already finding that the cost of keeping their educational, industrial, commercial and transportation infrastructure—plus housing and utilities—at current per-capita levels exceeds their financial capability. As one example, schools in Los Angeles are now terribly overcrowded. Lunch shifts in Los Angeles schools start at 9:30 in the morning and continue through the day, because the cafeterias can no longer handle the number of students." .Since the majority of immigrants arrive at a young working age, they contribute to the economy for decades, often while remaining ineligible to receive some social service benefits." 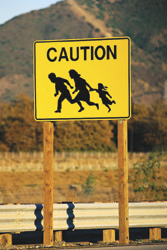 A 1997 National Academy of Sciences study, however, concluded that the net economic benefits of immigration were insignificant, and outweighed by their impact on taxpayers. The National Research Council has estimated the net fiscal cost of immigration as between $11 and $22 billion a year. Ben Johnson of the American Immigration Law Foundation counters that the Academy study is based on only partial analysis. "For example, it counted the cost of schooling immigrants" children, but failed to include their contributions when they started working," he said. Because of immigration, the U.S. is third among countries in the total growth of its population every year, after India and China. "Immigration is driving growth that could cause the U.S. population to grow to one billion by the end of this century," says Ryerson. A recent study by the Center for Immigration Studies shows that, in 2002, almost one in four births in the U.S. was to an immigrant mother, a record high. Illegal immigrant mothers give birth to almost 10 percent of all births in the country. A number of pundits, including Bill Elder, a dissident Sierra Club member whose focus now is on creating the Environmental Leaders Forum to address population issues, complain that high immigration levels negatively impact native-born minority populations. They point out that one half of Small Business Administration (SBA) set-aside minority contracts go to immigrants or their children. During the 1980s in California, employment for African-American bank tellers fell 39 percent, while jobs for foreign-born tellers increased 56 percent. (Similar displacement was also found among janitors, nursing assistants, hotel maids, orderlies and high-paying construction jobs.) "It is the most disadvantaged Americans, including black Americans, who are hurt the most by population increases, which depress wage levels and affect educational opportunities," argues Elder. Some environmentalists definitely believe immigrants are a net positive. Allen Hammond of the World Resources Institute (WRI) admits that there can be social and environmental problems if immigration becomes too rapid or too concentrated into a single small area. "This trend is nothing new: Pick your decade, and it was the Irish, or Eastern Europeans moving to certain areas," he says. "But if immigrants dispersed across the country they would be a drop in the bucket." Hammond stresses that the U.S. is a nation built of immigrants. "Our health, economic and political systems depend on immigration, and always have. Immigrants greatly reinforce our democracy and economy, and in fact without them we would be facing great difficulties," he says. Hammond cites a recent report by The American Immigration Law Foundation, which concluded that employment in about one-third of all U.S. job categories would have contracted during the 1990s without recently arrived, non-citizen immigrant workers, even if all unemployed U.S.-born workers with recent job experience in those categories had been re-hired. But the plain fact is that without immigration, U.S. population growth hovers around replacement level. in the U.S. "Forty nine percent of all pregnancies in the U.S. are unplanned," says John Seager, Population Connection’s new president. "About half of those pregnancies result in births, and their number is roughly equivalent to the amount of new immigrants every year. We have to look at which components of population growth can be dealt with most effectively." But Seager acknowledges that family planning initiatives face an uphill battle with the Bush administration in power. In recent years, a number of environmentalists have begun to question the environmental impact of U.S. immigration. For instance, the Federation for American Immigration Reform (FAIR) sees immigration as a root cause of California’s loss of open space (an area one and a half times the size of Rhode Island was paved over in the 1990s) and farmland (500,000 acres of cropland disappeared since the mid-1980s). NumbersUSA argues that population increases account for more than half of the sprawl that saw the 100 largest cities in the U.S claim 14,545 square miles of what was once farm fields and forests. A chart prepared by the Center for Immigration Studies shows that cities with no population growth between 1970 and 1990 sprawled an average of only 26 percent, but those with more than 50 percent growth sprawled 112 percent. Roy Beck, president of NumbersUSA, points out that the media frequently cite immigrants" role in reclaiming abandoned city neighborhoods, a key goal of so-called New Urbanism. "The problem," Beck says, "is that this process may at least temporarily revitalize the city, but it doesn’t remove a single person from suburbia. It doesn’t benefit the environment if what you’re really doing is adding people. And these new residents are very likely to move to the suburbs themselves as their economic situation improves. Their descendants are as likely to live in the suburbs as any other Americans." Critics of high immigration make the same argument about greenhouse gas emissions, and argue that immigration would make it very hard to reduce output. But WRI’s Hammond isn’t convinced. "Blaming immigrants is an unfair, irresponsible and very narrow way to look at environmental problems," he says. Hammond also contends that there are better tools to address high consumption rates. "The most effective solution is to change our system of economic incentives," he explains. "We need to restructure our taxes so that people pay based on the resources, such as energy, they use." As an example, Hammond says gradually raising gas taxes, while decreasing Social Security taxes, would transform American energy use over a few years while preserving economic prosperity. Given the controversy, it isn’t surprising that immigration policy is a "no go" area for most environmental groups. While limiting population growth was squarely on the groups" agendas in the 1960s and 1970s, the immigration issue has forced a retreat. "We would be perceived as assisting people whose motivations are racist," said Sierra Club Executive Director Carl Pope. There certainly are many racist groups whose main purpose is trying to limit immigration by non-whites (or specific groups they’re prejudiced against). But a color-blind immigration limit was heartily endorsed by civil rights activist and Congresswoman Barbara Jordan, whose U.S. Commission on Immigration Reform concluded in 1995, "We disagree with those who would label efforts to control immigration as being inherently anti-immigrant. Rather, it is both a right and a responsibility of a democratic society to manage immigration so it serves the national interests." Green leaders who have called for discussion of population and immigration issues include the late environmental icon David Brower, Worldwatch founder Lester Brown, the late undersea explorer Jacques Cousteau, Sea Shepherd campaigner Paul Watson, former Sierra Club executive director Brock Evans, former U.S. Senator Tim Wirth, Earth First! founder Dave Foreman, Harvard biologist E.O. Wilson and many more. A number of environmental groups also proclaim that population questions can best be addressed by, as Zero Population Growth puts it, "addressing factors which compel people to leave their homes and families and emigrate to the United States." Daniel Quinn, author of the influential environmental novel Ishmael, counters, "This is a will-of-the-wisp because these are things that people have been striving to do for thousands of years without doing them. And why we think that this will be doable in the next few years is quite bizarre to me." Hammond contends there are a number of practical solutions industrialized countries can take to make a huge impact in the developing world. He wants to see Western countries stimulating the growth of small businesses in developing areas, especially those that help close the "digital divide." He points to successful business models, such as the Philippines" largest phone provider, Smart, which offers ultra-cheap text messaging to 18 million poor people, and cites the fact that the region in the world with the highest growth rates for cell phone service is sub-Saharan Africa. But given the vacuum of direct U.S. government support for sustainable development aid, the task may be delegated to corporate, foundation and individual charitable donors and entrepreneurs. Currently, although immigration to the U.S. is three times the amount of the next-highest country, it is hardly a drop in the bucket of global growth. To absorb only the yearly growth of only the countries below the poverty level of Mexico would mean taking 70 million people per year in a country of 296 million. Despite all the evidence of global population increase, some demographers still insist the world is headed for a "birth dearth." Ben Wattenberg, a leader in this movement, has a new volume entitled Fewer: How the New Demography of Depopulation Will Shape Our Future (Ivan R. Dee). While populations are leveling off or shrinking in many parts of the developed world, Wattenberg conveniently circumvents the fact that U.S. population growth is soaring, with projections of 420 million by as early as 2050. The U.S. adds someone to the population every 12 seconds, and adds an international migrant every 26 seconds. The Census Bureau predicts there could be more than one billion Americans by 2100. It’s plain that the environmental leaders of the future will be coping not with a "birth dearth," but with swollen populations. How the nation decides to handle resource use and allocation, as well as immigration policy, will clearly have a significant impact on the world. JIM MOTAVALLI is editior of E.